No baby yet. However, I wanted to give a quick update on how things are (not) going. My weight has barely fluctuated a few ounces between my 35-38 week appointments, which is surprising after gaining a whopping 11 pounds over the 4 week span prior to that, but she's still growing and I'm still getting bigger. I haven't been consistent with taking pregnancy pictures, but here's a little example. By early October, I apparently looked "due," because when people found out I had over 3 months to go, you could see the look of pure horror shock on their face. I was already getting all of those questions I mentioned in Don't Ask a Pregnant Woman. This was taken right around Halloween. This was taken Monday, at almost 39 weeks. Same shirt, but you can see the difference...though I had a harder time squeezing my belly into the picture. At my last appointment I was 38 weeks, 2 days. My midwife recommended having my membranes stripped since I cannot be induced, (we'd already discussed it at prior appointments), so I agreed. She said she normally has success within 48 hours. With my second pregnancy I had the procedure done at 38 weeks and went into obvious labor 48 hours later. This time...no such luck, but I know that just means it wasn't time. I have my 39 week appointment Thursday. My biggest concern is what the midwife will say if there's no baby by then. I've read of women having their membranes scraped at multiple appointments, and I don't relish the thought, but I suppose I have to find out what other options I have to coax her out before I go over my due date. I know she will come on her own time, but I am starting to get a little anxious. Hopefully the next "update" will include baby pictures! I know every homeschooler goes through a time when schedules, routine and curriculum just aren't possible. We are in one of those times right now, as the kids and I are "living" away from home for an unknown length of time. My son's so young, that we could just take an all-out break. Except...I couldn't just abandon all lessons with an emerging reader, so I had to get creative and figure out how to homeschool away from home, and without our school materials. Luckily we are staying at our other house, so I had a few random things available to me. However, many of these ideas can be adapted to suit your personal situation if you’re staying with family or friends, traveling extensively, are in the midst of a move, or for whatever reason cannot stick to your curriculum. I am working with a 6 year old and a 3 year old tag-along. Obviously these ideas would need to be adjusted for older students. Spelling Games ~ I picked up this older game called Razzle at Goodwill awhile ago, but I didn’t take it with us when we moved, because we have other spelling type games. We don't exactly play by the rules. He looks for words in the dice, or if he is stumped, I call out words that I see. He picks out the letters and writes the word. We get reading/spelling and handwriting practice in a fun game. Literature ~ Audio books are a great option, because they do not take up much space and they also work well in the car. We have some on CD, and some that were downloaded onto the iPod ahead of time from Librivox. Other Ideas: Independent readers can use a Kindle, tablet or other device for reading; If you’re staying outside of your own library system, see if a family member or friend will borrow audio books, books or educational videos from their local library for you. Down & Out ~ This is another older game that I picked up at goodwill. I believe the more modern version is called Shut the Box. It's a great game for my math lover, because he gets to see how different combinations of numbers can all equal one sum. Here is an example of a pencil/paper version of Shut the Box as well. Equation Cards ~ I just happened to come across these cards in Target’s $1 spot. I can make equations for him, or he can make his own, since they are self-correcting with the corresponding number of dots on the back. Flash cards or homemade index cards would work just as well, and can be tailored to your child's skill level. Other Ideas: Acing Math: One Deck at a Time is a free e-book with math games created from a deck of cards. If I can find a deck of cards (or borrow one from the grandparents next door), we'll be trying some of the games out. Nature Study ~ To me, this is the easiest way to do science any time of year, but especially without supplies. We just take short Nature Walks, looking for things that interest us. The boys have spent a lot of time observing what happens to snow over time as the temperatures go up and down. Crushing ice is fun too! Other Ideas: if you're staying in a different geographical region, make a Venn Diagram and/or find other ways to discriminate between the weather, as well as native plants and animals. These Highlights picture cards also came from Target’s $1 spot. They are find-the-hidden-picture puzzle cards that also came with some generic paints. I bought a kit for each boy, and they can use the leftover paint for their own pictures later. Workbooks ~ I brought one multi-subject workbook with us, just in case he asked for any worksheets. If you really don't have much space, a basic workbook might be your best option. Field Trips ~ If I could, I would, but I'm miserably pregnant right now. However, field trips are a great way to "get away" (especially if you're staying with another family), and they're just plain fun! Be sure to check for free admission days or homeschool discounts! Right now, our field trips are taking short walks to the grandparents house. The boys are enjoying being near their farm again, and are even learning about pawpaw's hobbies--this is my favorite! iPad ~ We have a ton of free, educational apps already downloaded onto our iPads, which we also brought with us. I love the flexibility that tablets give us--portable and easy enough for even my 3 year old to use by himself! Computer Games ~ I have limited internet so our favorite supplemental websites aren't an option, but there are basic games on the computer like Minesweeper and various card games. I also installed Jump Start for him, which has multiple subjects. It's a little easy, but it's something different, since he doesn't get a lot of computer time anyway. 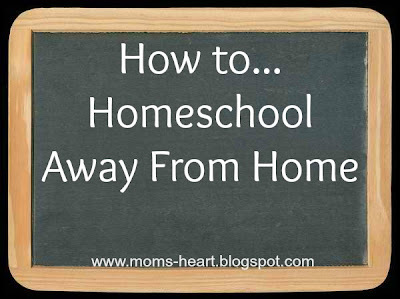 It was very easy for us to resume homeschooling away from home, once we found a routine that worked for us. It doesn't have to be our "normal" routine, and it doesn't have to be formal work. It just has to continue our desire to learn and grow. This post is part of the TOS Blog Cruise, and our topic was "How To " so be sure to check out what my Crew Mates are sharing! We are in the final stretch now. I have about two weeks until my due date, but I am very ready to hold my precious gift. When I go out now, I get the stares, comments and questions from other women. "You're almost there, aren't you?" "You have to be due any day now!" "I'm no midwife, but you look ready to pop." Actually, I've been getting the wide-eyed sympathy look regarding my due date since October. People would go from thinking I was DUE to that look of pure shock when they found out I had 3+ months to go. I don't mind genuine questions from friends and family. I don't understand why every woman on earth finds the need to approach strangers at the store and ask them their life story. You're only asking one pregnant person at a time, but that one pregnant person is getting asked various forms of the same questions from strangers day in and day out. She gets tired of it. You look like you're ready to pop! Do you think you'll make it? Well, I'm not sure spontaneous combustion is a form of delivery, but if it happens, I'm sure you'll hear about it on the news. Are you sure there's just one? I get it. I'm big. I'm only 5 foot nothing, so there's nowhere to go but out. What I don't get is why people think it's okay to ask a complete stranger if they're having twins...or triplets. Stare incredulously at my belly if you must, but I prefer you just whisper to your BFF behind my back. Yes, so leave me alone. That better be a girl in there this time! Seriously?? I really want to get snarky and tell people I'm so disappointed with my boys. First, it's none of your business. Second, what if we're not? No. No, I don't. Please enlighten me. If you have to ask a stranger to allow you to do something personal, the answer is always no. Why put me in that awkward situation? And please do not recommend to your little snotty-nosed, sticky-fingered child that they reach over and rub their dirty hands all over my white shirt to "feel the baby" because I'm sure you wouldn't want me, a random person in the mall, to start doing such things to you.